A pulmonary function test tells the doctors how well your lungs are working. It measures how much air you breathe in with each breath, how well you move air in and out of your lungs and how good your lungs are at delivering oxygen to your bloodstream. You must make sure you do not have a heavy meal before your pulmonary function test. If you are a smoker, you should not have a cigarette for 4 – 6 hours beforehand. If you need to take any inhalers, please tell the staff before you go to the clinic. You may need to delay taking them until after the test. Your doctors will tell you what would be best for you. Make sure you take your inhalers with you to the test. 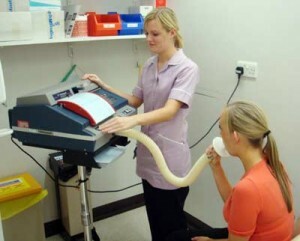 A pulmonary function test is carried out in a special laboratory in the hospital. First of all, you will have a clip placed over your nose and then you will be asked to breathe through your mouth, into a tube. This tube is attached to a machine called a Spirometer. You will be asked to take deep breaths in and out and the machine will measure how much air you breathe in and out during a set time. You may also be asked to do this whilst you breathe normally. As part of your pulmonary function tests, it may also be necessary to breathe in a small amount of carbon dioxide. This is so the staff can assess how well gases leave your lungs and enter your blood stream. You will also have a small prick to your ear lobe, to measure the amount of oxygen actually in your blood. To find out how much oxygen can fill your lungs, you may be asked to sit in a special box called a Plethysmograph. The staff will explain what you need to do before each test is carried out. Feel free to ask them any questions. Before you leave the hospital after your pulmonary function test, make sure you have an appointment to go back and see your doctor for the results.